Aerial hot air tethered balloon rides DURING AUSTRALIA DAY IN PARRAMATTA 2018 EVENT will be ALLOCATED THROUGH a ballot system. All registrations must be made online – there will be no registrations by phone or in person. If you have accessibility issues that prevent you from registering online, or for any questions about the hot air balloon ballot process please contact Riverside Box Office on 8339 3399. Ballot registrations open 9am on Thursday 4 January 2018, and close at 5pm on Thursday 11 January 2018. Once drawn, successful entrants in the ballot will need to pay the cost of $10 per ticket, with proceeds go to support Parramatta Mission. Follow the link to register your interest and enter your contact details. Ballots will be drawn at random. Successful entrants will be notified by email on Friday 12 January 2018 and emailed a link to book and pay for up to 6 tickets and select their ride times. Tickets will be sent via email. If successful entrants do not book and pay for their rides by 5pm on Monday 15 January 2018, their tickets will be released back into the ballot and a second round will be drawn. 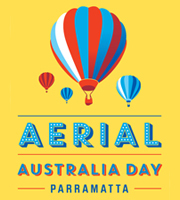 Aerial hot-air tethered balloon rides will be held between 6-9am, Friday 26 January 2018 at the Australia Day in Parramatta event in Parramatta Park. Please note that the purchase of the hot-air balloon rides is a non-refundable donation, including if the rides are cancelled due to unforeseen circumstances including, but not limited to, poor weather conditions. The cost of your ticket goes directly to support the operational costs of the hot-air balloons display and Parramatta Mission who, for more than 40 years, have provided services to those in our community who are facing homelessness, crisis and those living with mental illness. Parramatta Mission thanks you for your support. Children under 6 years are unable to ride due to safety reasons. Prior to booking, individuals must ensure they have no medical condition that will affect their participation. A tethered balloon ride requires the passenger to embark and disembark the balloon basket without assistance, therefore any person with limb, spinal injuries or a disability that inhibits their ability to climb or the elderly or frail, are therefore advised not to participate. Should you have any questions with regard to a pre-existing medical condition please ask your pilot as in most cases these will not prevent you from participating. Balloons are tethered (tied to the ground). They will rise to a height just above the tree level and descend. All personal effects such as cameras and videos are carried entirely at the risk of the passenger.